SAFFORD – On Sunday around 5:30 pm, an officer was called to a residence on 4th Street where it was reported the victim’s neighbor kept coming over to their yard and talking to their children about drugs and scaring them. 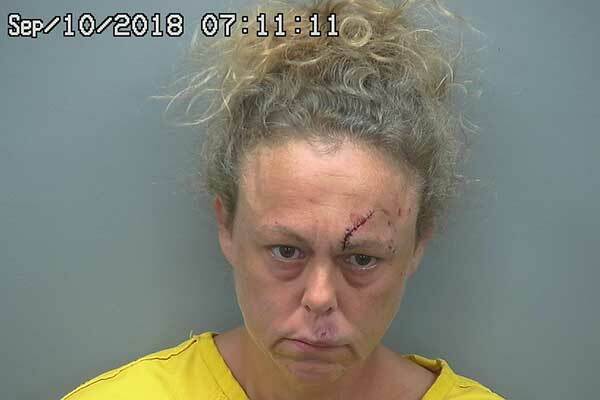 As the officer was speaking with the victim, the neighbor came over and spoke to them, stating she was going to buy their house so they can be ‘tribal.’ The officer noticed that the neighbor, identified as Dawn Whaley-Sheldon, was barefoot, and appeared to be intoxicated due to the noticeable odor of alcohol coming from her breath as she spoke. The officer informed Sheldon she was not allowed on the neighbor’s property and to not have contact with the children again. Sheldon replied that she would not talk to them again. About 40 minutes later, the officer received a report that Sheldon had returned to the victim’s residence. It was reported that Sheldon had come back to the residence, placed a rock in their yard, and told the two children she was going to stuff Cheetos down their throat so they couldn’t tell their parents secrets anymore and she didn’t care how young they were. The officer contacted Sheldon at her residence to inquire if she had gone back to the neighbor’s property and done the things that had been reported. Sheldon denied doing any of it, but then stated to the officer that she had gone over to tell them that she loves them, and she doesn’t want to hurt children. The officer informed Sheldon that she was going to jail for disturbing the peace. The officer made several attempts to get Sheldon to retrieve her shoes, but she refused. Sheldon also claimed the neighbors were stacking witnesses against her and that they were drug dealers. Sheldon was extremely unreasonable during the arrest and another officer arrived to assist in placing Sheldon into the back of the patrol vehicle. Sheldon was transported to the Graham County Jail. She continued to be unreasonable and refused to sign any paperwork. Sheldon has reportedly had at least 45 contacts with law enforcement since July, 2018.